The American Elm Tree, also known as the white elm or water elm, is a large and hardy deciduous tree species native to eastern North America. Scientifically referred to as Ulmus americana, American Elm Trees are notable for their expansive canopies that reach widths of 60’-100’ | 18-30 m and overall heights between 50’-100’ | 15-30 m. American Elms are naturally found in rich habitats that include floodplains, streams, swamps, hillsides, uplands, and mountain rivers. Once living for several hundred years, the lifespans of American Elms today are now limited to under 100 years due to Dutch elm disease. How fast does an American Elm Tree grow? American Elm Trees grow quickly in any environment at a rate of 3’-6’ | .9-1.8 m every year. 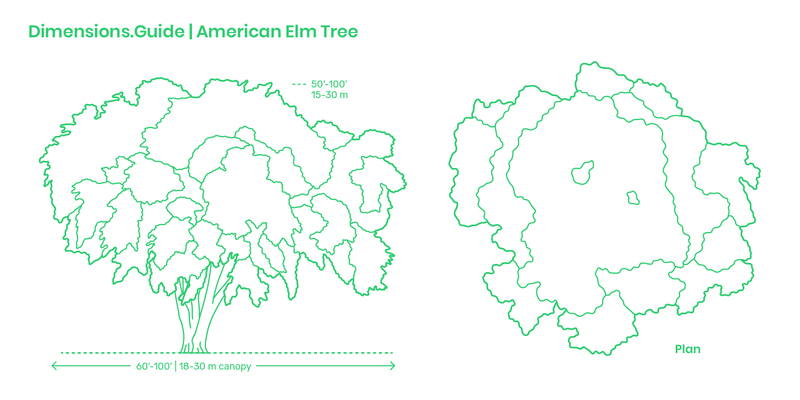 How big are American Elm Trees? American Elm Trees commonly grow to heights between 50’-100’ | 15-30 m with large canopy widths between 60’-100’ | 18-30 m.
How long does an American Elm Tree live for? American Elm Trees once lived up to 250 years, but due to Dutch Elm disease, most American Elm Trees today will not live beyond 100 years.